Cherdo on the Flipside: "Torn" BOTB Results! The picture says it all! Natalie Imbruglia ran away with it. Perhaps it only makes sense - she was the artist who took it to number one. But was Natalie Imbruglia the first to do it? NO! This was an Ednaswap original. As many of you noted, it was nice to hear this tune with more of a edge. Join us for STMcC's Presents the Battle of the Bands on the first and fifteenth of each month. Then come back to see the totals and find out who one the battle on the seventh and twenty-first of each month. Don't forget to visit all my pals linked below. I like the Ednaswap version, too. I didn't know this song was a remake! I always liked it. I never noticed until now how unique Natalie Imbruglia's voice is. She has a little something extra in there I never paid attention to before. To me, it's hard to choose on this one. I didn't vote because she didn't need my vote and Ednaswap couldn't be saved with one vote. Sometimes, I get jaded on the ones that had too much airplay. Yessum, I prefer music with an edge these days and that's why I voted for Ednaswap. In a battle between Natalie and Lea, Natalie would have received my vote. All in all the votes were rather evenly distributed making for an interesting and enjoyable contest. Thank you dear friend Cherdo, and have a great week ahead! Ednaswap's version is pretty sweet and I totally agree with the Natalie vs. Lea outcome. Lea Michele has a great voice but I guess the whole "Glee" thing kinda ruins it for me - which is totally unfair, but honest. And still, for all of that, when I hear this song the only thing I can think of is the guy that mimes out every single word of the song from that old viral video. That is hilarious, for sure. Have you seen the expanded version where Natalie Imbruglia comes out and does it with him? almost doubles the blows for the win. I'm sure she is gloating right now, ha ha. You had a clear winner this time! Yes, is that good or bad? Natalie Imbruglia is a wonderful singer and harkens back to the female indie rockers of the late 90s. A well-deserved win. And she's cute - like a pixie. She has a wonderful voice. I LOVE Natalie's song Torn! How did I miss your BOTB? Well, I'm glad she won! I think all the Ednaswap voters feel the same. I'm glad Natalie won. I am a ditz!! I got confused and thought I couldn't vote for her and that it was only between Lean or Ednaswap. DUH! Glad my vote didn't stop her from winning. Yeah, that's my fault. I put three in there - I wanted to add the "who did it first?" factor because I was a bit surprised to find it was Ednaswap. 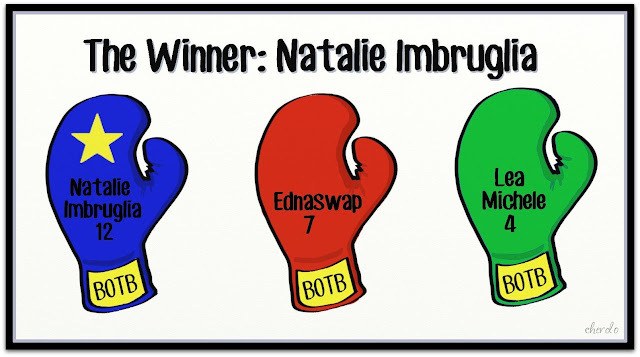 I didn't know Ednaswap had the original version of this song, but I'm not surprised Natalie won. (Still preferred Ednaswap.) Her rendition was the most well-known. Interesting battle! There was unquestionably a clear winner! I'm torn about these results. Then they'll be two of you...cool beans. I spend quite a bit of time lying naked on the floor while I wait for Franklin to do the laundry. Then this is your theme song. I'm not surprised Natalie won. Congratulations to Natalie. An impressive win. I would have voted for the Sid Vicious version, but you didn't give us that option. That was the shortest STMcC ever...are you sick or am I out of the "inner circle" of Stephenites? Oh, DOC CHERDO, don't even try to pretend that you can get off the Crazy Train. This train makes no stops and it's too fast and dangerous to jump off. But none o' dat has nuttin' to do with nuttin'. In fact, I'm working on a long blog bit about my first 3 months in Reno, and I was just writing about you and how you did a "bagged and tagged" bit about that. So, keep yer eyes open. Hoping to get that posted sometime tomorrow. I knew something was up with D-FensDogG. I'm on the crazy train ham radio of psychic connections. Oh, no! I don't want bad stuff in the family. I hope it's something that will pass by and keep on rolling down the road. If you have to take a test, take a urine test. You can pass that; urine means "UR-IN first place for this job." Aren't you too old for a bike yet? Those three wheel jobbers would have kept you safe and you can have streamers from the handlebars. You'd look stunning with streamers. Reno folks have no problem with that kind of flash. Take care of yourself and I'll be looking for your next tale o' Reno Does Stephen. Thanks! I like to doodle things for the blog. Thank you! I try very hard to draw childishly. Ha ha. No surprise here, as Natalie had that ole familiarity vote going for her. I actually had no idea that she was not the original. Me, either! When I realized that, I thought it would make a good BOTB. A three-way always creates a greater vote split. Wonder how it might have gone without Natalie in the mix? I think Lea gets unfairly dissed sometimes as she is very good. That was an excellent contest. Thanks, Lee! I sort of wanted a split and Natalie didn't do it first. I think all the young people on "Glee" don't get their due. It's such a hit, then such a target. The public is fickle...and hateful. Yea! I love this song!!!!! Ha ha ha...no one ever gets excited on my blog. Now I love you. The results on this one don't surprise me at all. I love your comics, girl.